Over the years, I have been replacing a lot of beauty products with cruelty-free products and I couldn't be happier. I have always been a supporter of cruelty-free options but I have been doing much more research on a lot of our basic household items and beauty products. Boy, oh boy! I felt as if I was left with an empty beauty cabinet at the end of it all. If you are in the process or thinking about going cruelty-free with your beauty products, I suggest taking it slow. Do your research and replace your items one at a time. You want to make sure that the transition is a positive experience. If you are replacing everything at once, it will hurt your wallet. Let's face it, make-up is expensive. I wanted to give you all some of my suggestions for beauty alternatives that are cruelty-free. Benefit might have the cute packaging and cleaver product names but there ain't nothing cute or cleaver as to what goes on behind the scenes. Benefit conducts animal testing sadly. They have not made any notion that they are ever thinking of moving towards a cruelty free makeup line. Instead of using any of their concealers I recommend using Kat Von D's Lock-it Concealer. Not only is Kat's line amazing for being cruelty free but the entire line is also top notch quality. Her "Lock-It" is nothing short of perfect. I use her Lock-It concealer and powder for that all day coverage and matte finish. You can find it at Sephora. MAC STILL tests on animals so I stay clear of their products. I used to use their line of liquid foundations in high school and noticed that it would dry my skin out. A great alternative is the new Whipped Foundation by The Balm called "Even Steven." I definitely use The Balm on a daily basis, and their new Even Steven Whipped Foundation is no joke! I love the feel and finish of this foundation. It is technically not a liquid foundation but goes on lightly as a whipped foundation and instantly turns into a dry powder like finish while giving amazing coverage without using a lot of product. You can purchase yours at TheBalm. It was a total surprise to me that Make Up Forever was not a Cruelty Free brand since their products were top notch and used in the professional world of makeup. A great alternative to their Pro Finish powder would definetely have to be Kat Von D's Lock It Blotting Powder. Their powders come in different shades. This powder is a true game changer...especially for those with oily skin such as myself. I notice a big difference in how long my makeup stays throughout the day if I use this or not. You can purchase yours at Sephora. Let's face it...blush is that one item we all finish off our look with. Blush just gives us that fun flirty finish! Instead of buying a blush guilty of being cruel to animals, opt for a cruelty free option with Too Faced cosmetics. Too Faced is not only great quality make-up, but also has each one of their gems come in the cutest packaging. You can purchase Too Faced products at Sephora. Our look is always topped off with a good setting spray and it really makes a difference throughout the day. MAC, as said before, is still testing on animals so an AMAZING alternative is Supergoop's Setting Mist with SPF 50. I love that this setting spray has the added protection with SPF 50. It is rare to find that in a setting spray. This particular one is that final touch to my makeup because it really does it's job. I highly suggest buying this by the small travel bottles though because the formula does tend to thicken and clog up the bottle when you purchase the larger size. You can purchase yours at Sephora. I used to be an avid Maybelline mascara user back in high school because it really gave you that dramatic eyelash look without breaking the bank BUT they do test on animals so that product is definitely in the trash now for me. An amazing alternative to this mascara would definitely have to be Too Faced mascara. It is one of the most popular Cruelty-Free Mascaras by a landslide. You can get yours at Sephora. I used to be obsessed with Benefit...I mean their packaging alone was such a seller for me. But as I did more research on animal testing I realized that they were not an animal friendly brand. They currently test on animals, especially since they sell in China where it is required by law to test on animals. Very sad. Their Watt's Up highlighter is very popular. It comes as a stick with a smudger/applicator at the other end. Looks great BUT the application kind of looks harsh and when you try blending it to look more natural the formula kind of ends up looking cakey. I suggest getting The Balm's Mary-Lou Manizer Highlight instead. O-M-G! I can't even begin to tell you how incredible the finished look is when you use this highlighter. You only need one application because it is very pigmented with the highlight effect. It's light and luminous. I swear by it! I noticed Kohl's online now has it but you can also purchase it at TheBalm's website. 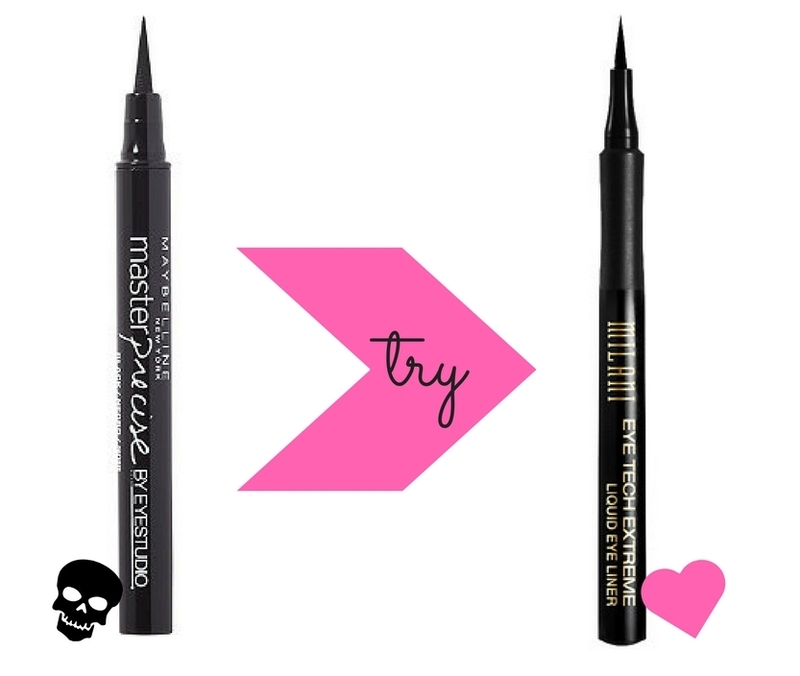 There are two makeup staples I can't live without; Mascara and EYELINER! Drug store "go-to" brand Maybelline is definetly not a cruelty-brand and from the looks of it they do not plan on being one anytime soon. They are known for being low-budget friendly, but there is another option that is both cheap and cruelty-free. Milani is that option! Milani is another drug-store budget-friendly option out there.